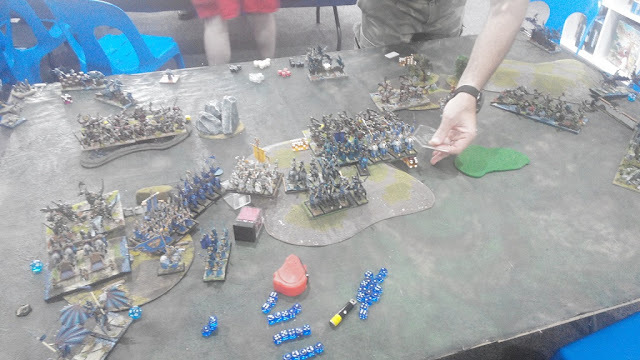 In the round 2 of Australian Masters 2017 I had a great pleasure to play against Andrew and his Abyssal Dwarfs. Andrew came a very long way from Melbourne to participate in the tournament and it was the very first time I had a chance to play against him. He commanded one of the two Abbysal Dwarfs army with a strong theme of slave warriors force. There were very few Abyssal Dwarf in fact, as the arm's main body count came from three hordes of Slave Orcs! Those two Heavy Mortars were dangerous and the army as a whole looked very intimidating. I tried to look for some weak spots to exploit and I noticed that the army does not have that much inspiring presence due to only 2 heroes. Because of that I wanted to try and spread the shooting aiming at Gargoyles as even a single point of damage could result in wavering or routing the unit. In particular, if they were not close to Ba'su'su. I also wanted to get to those nasty mortars as soon as possible and expected them to be at the very edge of the deployment zone. The job for the Drakon Lord then. I did not have more time for further deliberations as we started deploying the armies. Deployment and Scavenge marks placement. We played Scavenge which was a new scenario for me (funny how sometimes one still finds scenarios that were not played before!). Again, with not much time to consider I decided to treat it a bit like Loot so that I could have had at least a reference point. The markers were placed on both sides of the middle one but still relatively close to the center. I knew I cannot fight the enemy head on as the hordes had better chance of winning the war of attrition. However, Andrew deployed in a way that allowed him to spread his army and cover all venues to his mortars. 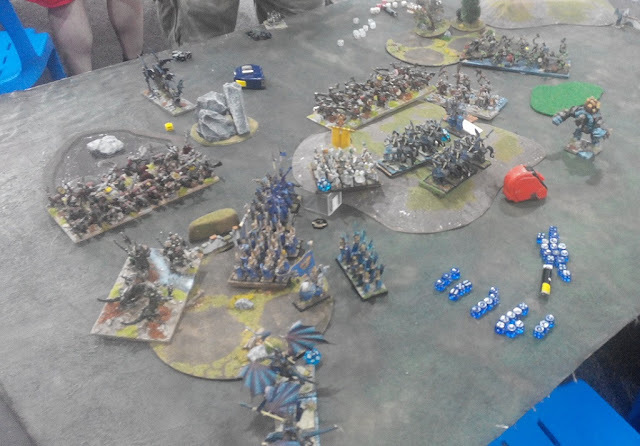 I decided to try weighted flank deployment with single unit of Drakon riders on the right to sneak around and avoid being shot at by the mortars. The center was to shoot ar Gargoyles and slow down the advance of the enemy. 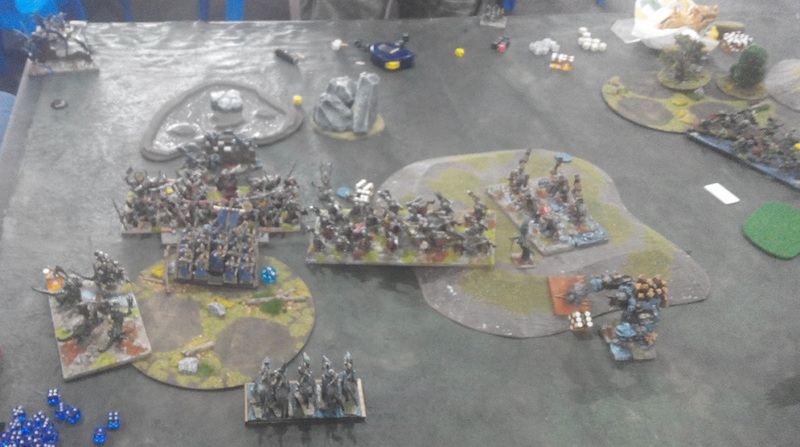 The left had more units and I hoped to be able to win that flank as I had small advantage in numbers. I tried to hide some elements behind the terrain, which was not ideal as it also meant they could not see advancing enemy. Andrew won the roll off and chose to take first turn. 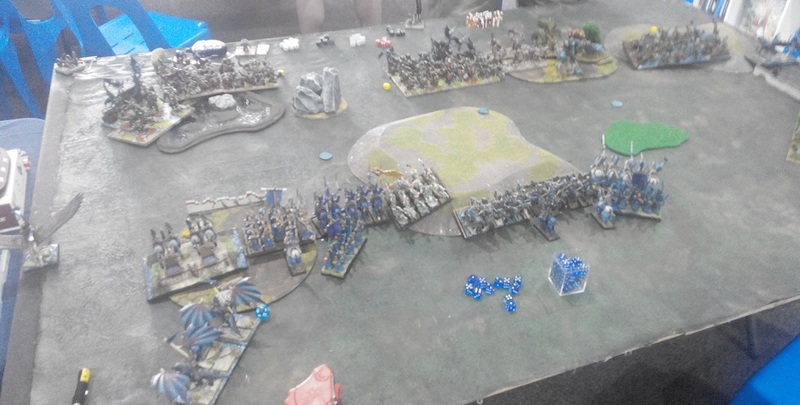 Abyssal Dwarfs herd their Slave Orcs forward. 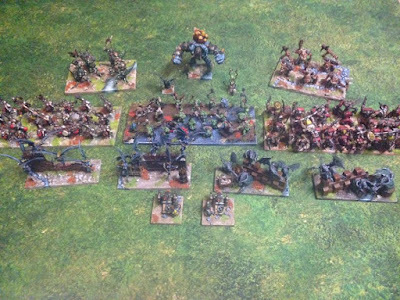 Abyssal Dwarfs army moved slowly but with a purpose forward. As usual, the thundering sound of the heavy mortar salvo was accompanied by laud war cries of the Slave Orcs. The shells hit Drakon Riders and inflicted some serious damage already. Elven bow fire is less impressive. 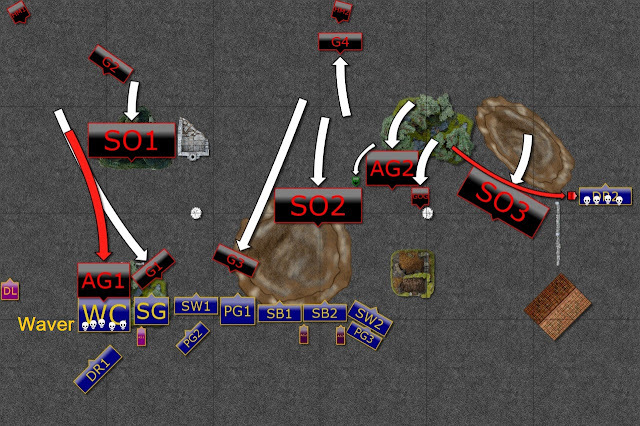 Elves moved forward a bit, tempting the enemy units on the left with early charges. 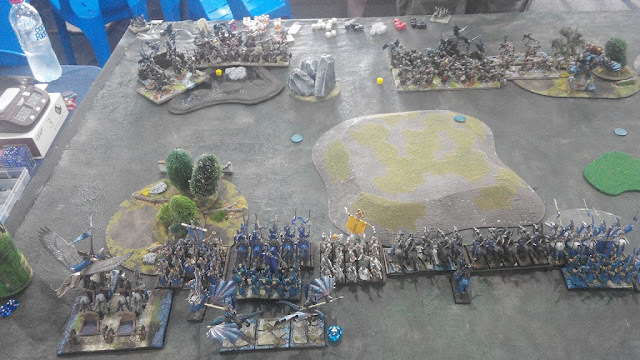 Drakon Lord on the left and Drakon Riders on the right moved along the flanks to try and land behind the lines and get a chance to eliminate the mortars soon. In the meantime, the Silver Breeze cavalry tried to rout Gargoyles but they were well covered and the damage that was done was not yet enough to shake them. Abbysal Grotesques on the Elven left flank took the bait and attacked the chariots. Despite hindered charge they managed to waver their foe. 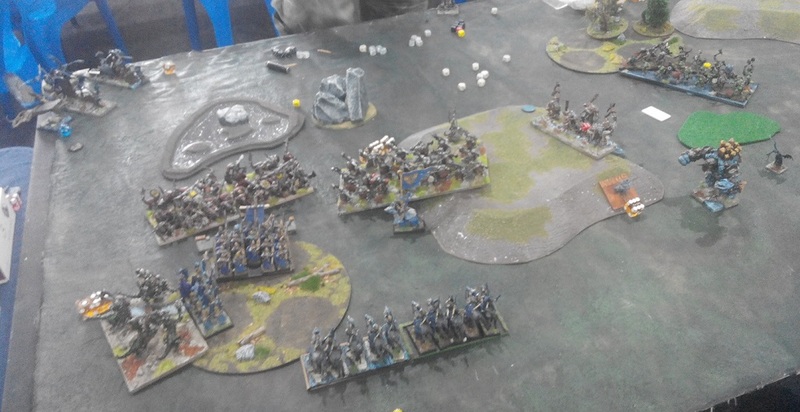 At the same time, Gargoyles covered the attack and blocked the other Elven units. The rest of the army kept advancing while Ba'su'su intercepted Drakon Riders on the right flank. Elves attack through the center. The trap to catch the Abyssal Grotesques did not work and Elves had to first fight off some annoying Gargoyles to open the way for their units.Drakon Riders behind the Chariots could not assist either and did not move to avoid the risk of being shot at. 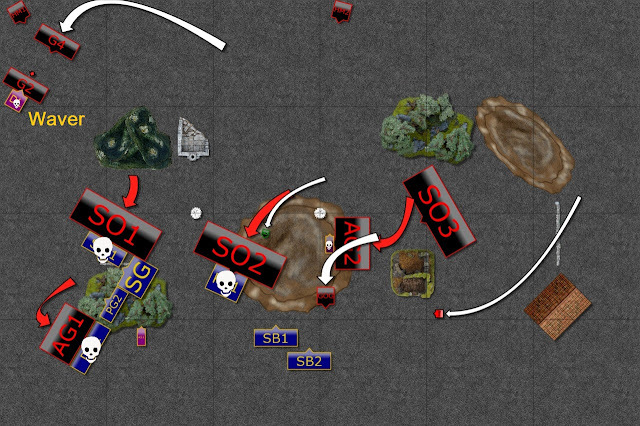 Drakon Lord, however, moved to the opening left by the enemy infantry and landed as close to the mortar as possible. In the meantime, the units in the center also charged in but they did not inflict sufficient damage to break enemy formation. 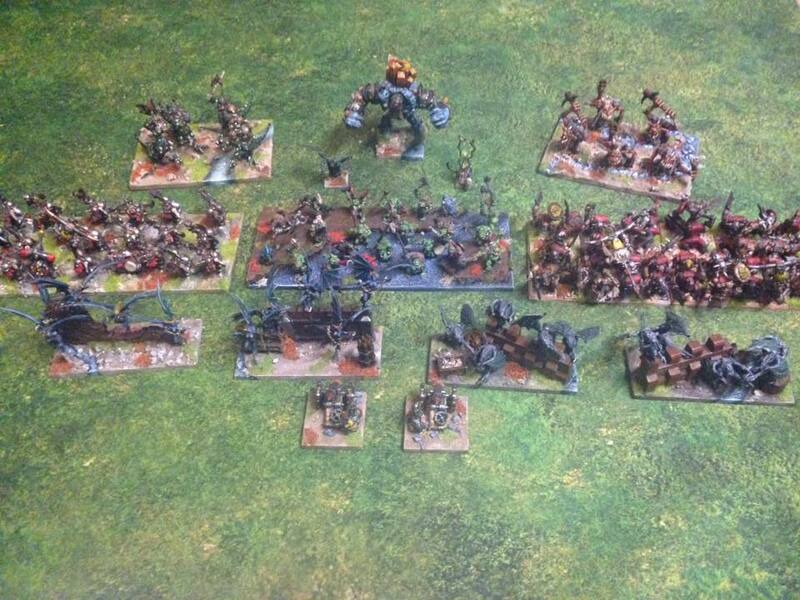 Abyssal Dwarfs army continues their rampage. 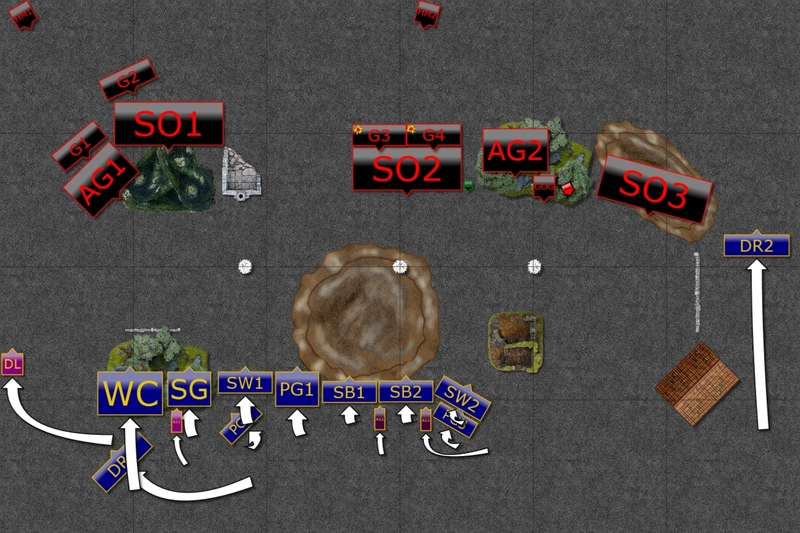 Powerful attack claims four Elven units! Abyssal Dwarfs army attacked over entire front and inflicted a huge damage upon Elven units. First, Abyssal Grotesques finished the chariots. Then, Slave Orcs in the center routed small unit of Palace Guard while Obsidian Golem made a short work of the Elven knights. Ba'su'su got rid of "his" Drakon Riders and even lowly Gargoyles intercepted and grounded Elven Darkon Lord! 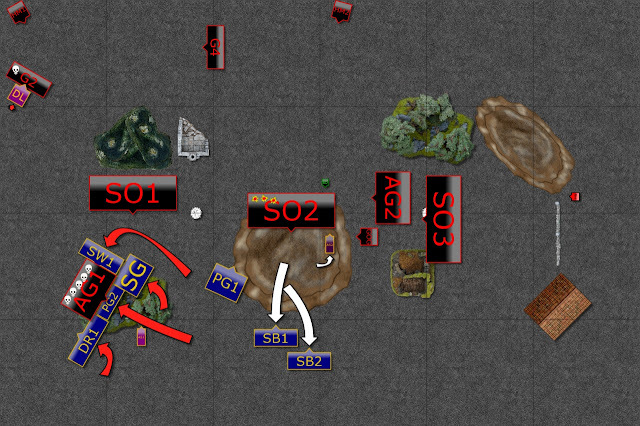 Elves try to push back on their left flank. Unfortunately, the attack does not succeed. As the attack on the left flank failed, it was now time to pay the price. Drakon Riders fell to Abyssal Grotesques while Storm Wind cavalry and damaged Palace Guard regiment were routed by Slave Orcs. Even Drakon Lord got wavered by the Gargoyles! With very few units left it was now a matter of simple survival. Would Elves be able to safe any of their units? 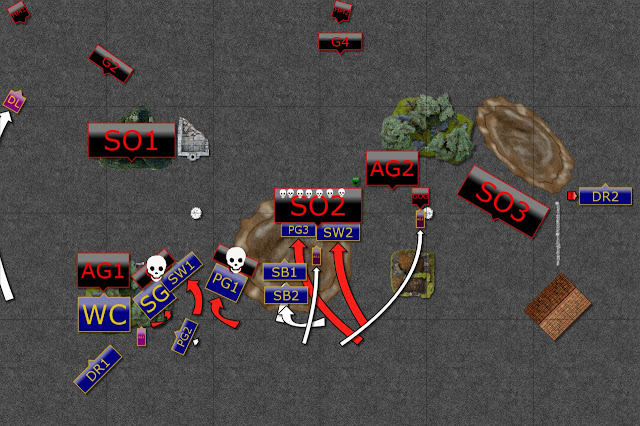 Silver Breeze cavalry kept shooting at their enemies but somehow arrows flew wide and off target. Two more units are down. 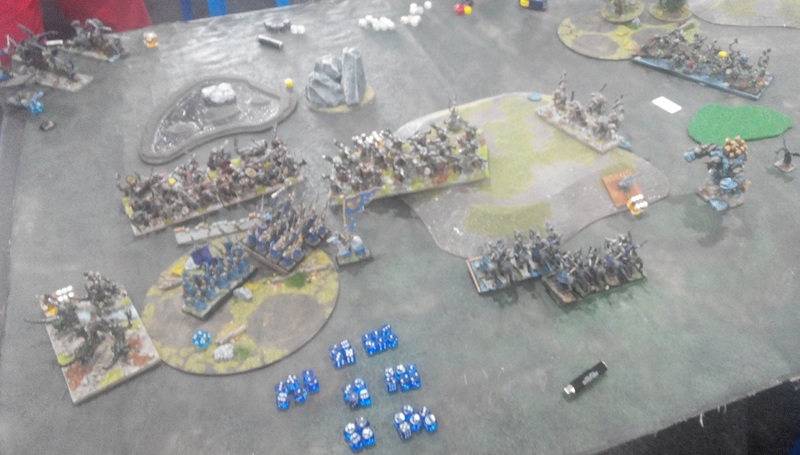 Abyssal Dwarfs army kept pushing forward to make sure no one escapes. 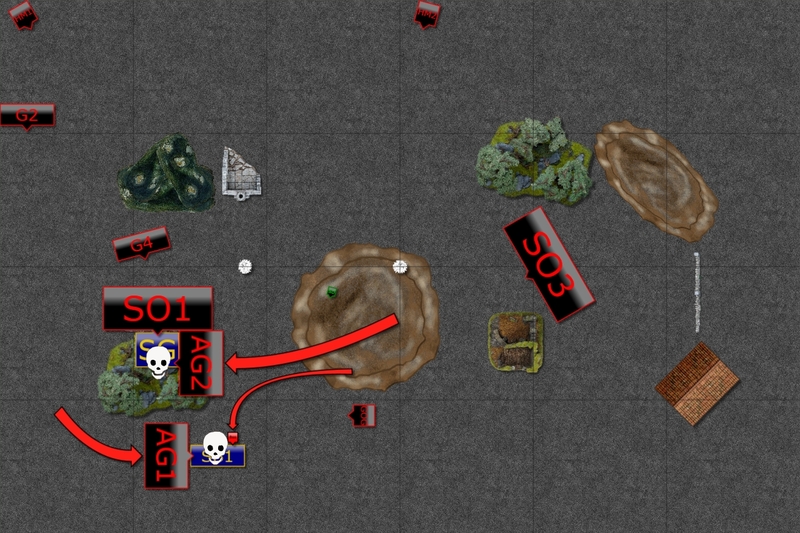 Palace Guard was easily defeated by the Grotesques while one of the Silver Breeze troops got hit by the heavy mortar shell and ceased to exist. Slave Orcs are finally routed - but it is too late. Elves lost all their hope and shot their arrows for the last time. Slave Orcs have had enough of the bow fire and fled. 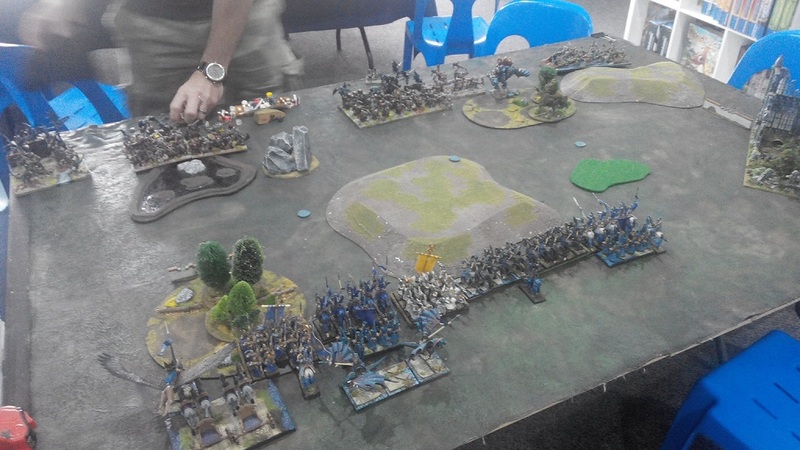 Elven units had nowhere to run and Abyssal Dwarfs finished the last pockets of resistance. The Elven army was utterly and completely destroyed. Congratulations to Andrew for a well deserved and complete victory! It was great to play against him and I just wish this battle was not one sided and that I had been a more demanding opponent. 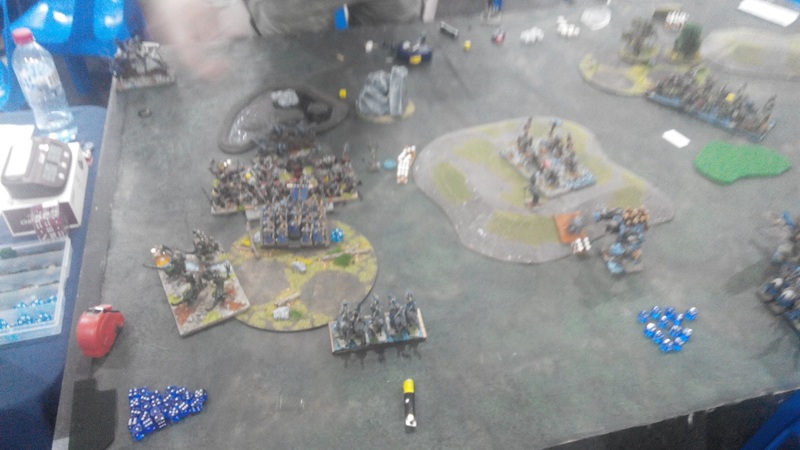 Andrew deployed his army very well, covering entire width of the battle field. At the same time his use of Gargoyles was superb and I was really impressed how versatile they can be. They are far more than cheap and fast expendable units. In this game they did great as interceptors and allowed the Mortars to keep firing in each turn. He also perfectly exploited any mistakes and openings I made. And boy, I made tons of them! When I looked at our game again, during making the diagrams I came to the conclusion that my plan was not good and that I deployed poorly. I think I fell into the trap of being intimidated by the mortars. While trying to block line of sight is in general good idea, I did it at a cost of my own maneuverability and I was too passive with my own units. If I were to play this game again I would need to accept that there are going to be casualties and deploy with that in mind. 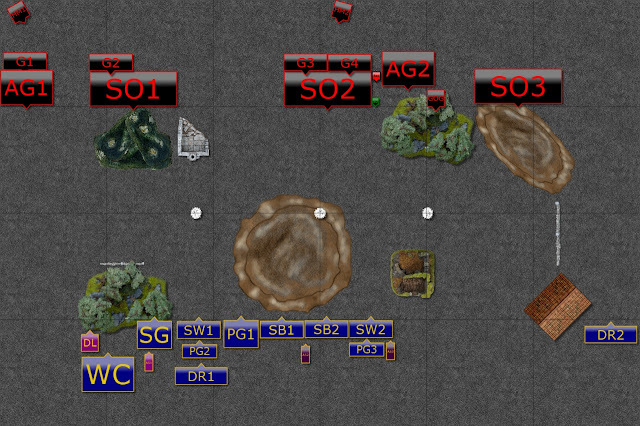 It means that I should have placed the units in a way that would allow them to engage the enemy or threaten the advancing units from turn 1. While the idea to shoot at Gargoyles to remove the most maneuverable threats is in general a good plan, in this game I didn't use the chance to actually inflict damage upon advancing Orcs. With defense 4+ they are more likely to get hurt than their free cousins. I should have used my bow fire to at least damage advancing unit in order to be able to break them with my faster units. 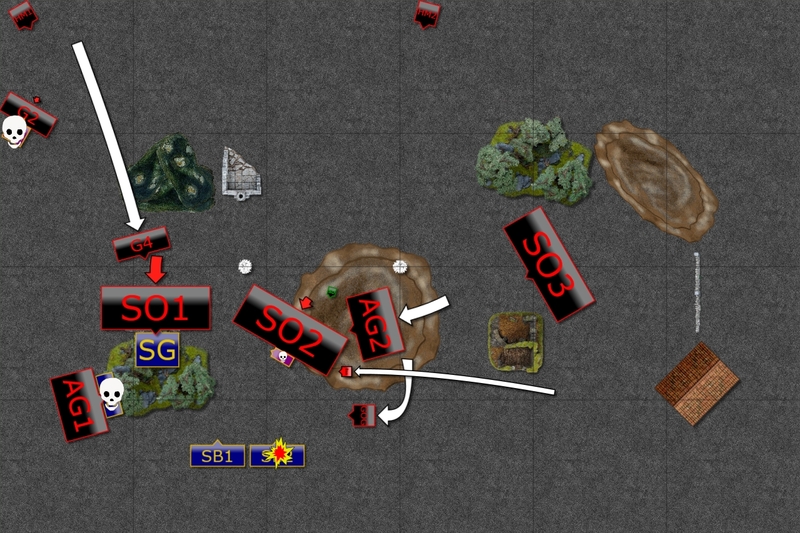 The attempt to use terrain on the left was a good idea in itself but the trap should have been set with different bait. Or I should have simply positioned Palace Guard there as they are still quite reliable in the terrain. Unlike Andrew, who coordinated the movement of his units very well, always providing mutual support, I failed here too. The fact that I forgot to move Drakon riders, to rout grotesques or to roll dice for Palace Guard troops, were more like consequences of bad moves and decisions before. After jumping the gun in turn 2 where I attacked middle Slave Orcs with only 2 units of my own, was in my opinion the moment where the course of battle changed from bad to catastrophic. No wonder I lost my entire army soon after and the game, from my point of view, was only about survival and trying to save any unit. Ouch - rough game mate, I think your summary is right, it looked bad from the start. After reading 2 reports I think you might have been feeling the pressure? too many simple mistakes. Can't wait to read the rest. Thanks for the comment! It is a good question. I thought I do not feel the pressure and the focus was high on one game at a time. But there is always a lot going on in the background of your mind and I wonder how much that affected my performance. I certainly didn't expect to make that many mistakes so something definitely affected my decision making. I will do my best to provide a new report during the weekend! Yeap, it was painful experience. At this level of competition any mistake will be punished more than usual. Slave orcs and gargoyles are both known to be underpointed and most likely will have their points increased in CoK18, so don't feel too bad about this loss fighting against an army that spammed those units. Thank you for your comment and support. I greatly appreciate that! I didn't know that Slave orcs and gargoyles are considered not priced correctly and that it may be addressed in CoK 2018. I didn't mind that there are 3 hordes of Orcs and 4 troops of gargoyles though. In fact, it was the first time I played against such army and I value the experience, even the tough one when I got tabled. My plan was bad and I made a lot of mistakes and that contributed to my defeat. At the same time, Andrew had a solid plan, executed it very well and exploited my mistakes. He should have been awarded with a very good result and he was! The good thing about it is that I can learn from such games and there is room for improvement! 1. He has a fantastic list, and he played it fantastically. I remember in the event preview mentioning how nasty this list was because of the gargoyles and basusu. Gargoyles, basusu and slave orcs are all taking a hit in the new CoK18 I think which makes up most of his list! 2. Mortars can be very game breaking if they are on and it’s hard to counter them. They don’t take penalty from cover if I remember correctly. So the only other option is to hide completely which is not an effective countermeasure as you saw. It is usually better to just accept casualties and advance, but if they have a few good turns (especially against your list without hordes) a hit can usually be a dead unit! 3. I still think shooting at gargoyles is the right play. You have the cav and chariot shooters which can shoot over slave orcs and a couple points of damage is “usually” enough to render them ineffective. Did everything that could shoot shoot at them (chariots and both cav units)? 4. You don’t have a good counter for basusu in your list. Not many lists do. Basusu is great against units with lower nerve (troops and regiments) because she has a high enough volume of attacks to waver/rout with a decent roll. Baiting and having a unit ready that can punch hard is the best way to deal with her. You had the drakon Riders there as bait but no unit to counter. 5. I wouldn’t have used the chariots as bait early in the game. They are some of your most versatile pieces and are fantastic in the late game. 6. Human error (forgetting to move/attack) will happen eventually and it is a good learning experience. 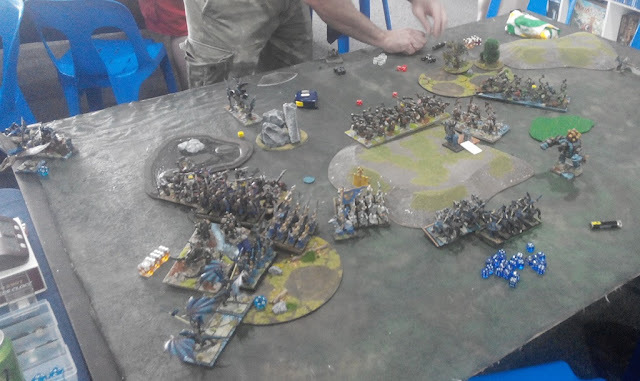 At my last tournament, in my first game (which was one of my two losses) I forgot to deploy a 170 point unit in an 1850 game :0. I was so embarrassed! But I learned from it as I’m sure you did. 7. The biggest surprise mistake was the double charge against the middle horde of slave orcs which was a high risk with a low chance of success. Sometimes when we look back when we aren’t in the middle of the game we think, “what was I thinking!” I think that often in my own games haha! 8. The key to beating his list is either removing the gargoyles before they can cause problems, or forcing him to use them in situations that he doesn’t want to which is much easier said than done. Being able to threaten multiple units is the trick. Then he has to start making tough decisions! I bet you’ve learned more from this report than most of them. I appreciate you writing it up even though it may have been a tough one to think about again, but as you can see from the comments, many people got to learn from this one which is what it’s all about! 1. I agree. Andrew played very well and even if I didn't make mistakes he would have played a very solid game. I like how each element of his army has a good role to play and how they interact with each other so that the army is more than just sum of the units. I wonder what is his list going to look like after CoK2018 release because his units are going to be affected. 2. Yes, with Indirect rule they can ignore cover as long as they see the target and with 60" range they can reach far. 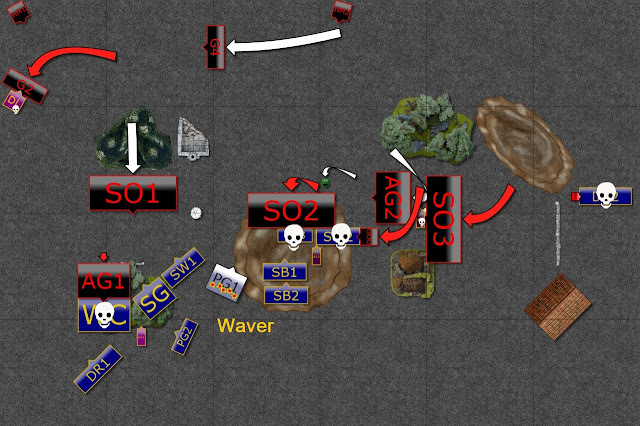 Taking cover is risky because it significantly limits the options for movement and charges so my intention was to do so only for the first turn. But even then it was tough. Andrew mentioned that his Mortars play that role where you can't ignore them and you need to detach some fast and potentially powerful elements to silence them down. But in doing so you do not engage with the main battle line and and any damage mortars do in the meantime is a bonus. 3. I tried to shoot at them but Andrew played his game well. First, due to poor deployment I could not reach all the units I wanted in my first turn. 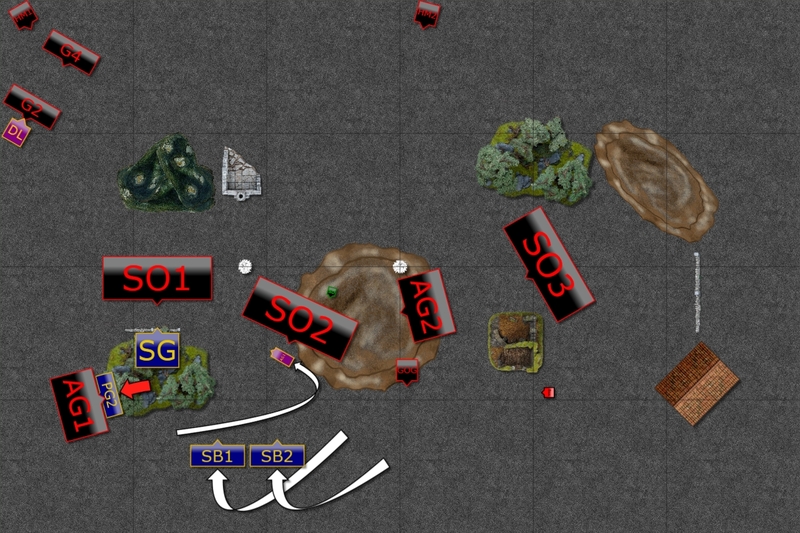 Then the chariots got charged and due to proximity of the melee, Sea Guard was also in difficult situation. 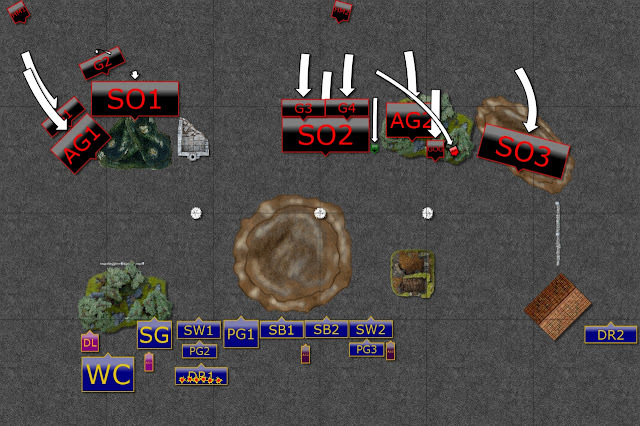 Fast cavalry soon was in the situation where to reach Gargoyles it also had to get into charge range of other units. 4. I haven't played against this hero before but I assumed it is a difficult target to take down so if he is occupied elsewhere then great! Unfortunately, I didn't quite plan to distract him with Drakon Riders. If only I kept them moving that would have meant he is a bit further from action. He joined the fight when the game was decided already so lesson for the future is that I may need to sacrifice Drakon Riders, for instance, to make them the only victim of his attacks. 5. I didn't quite intend to use Chariots as bait but when I discovered I can either do so and still try to shoot at gargoyles or stay away from the charge distance but not shoot at them I chose the former. Andrew initially was not sure it is a good idea to attack either but he decided to do so in the end and this time that paid off. 7. This charge was a consequence of bad maneuvering earlier. I noticed I cannot comfortably pull back so I decided to charge to pin the horde down and get into flank with my Palace Guard regiment next turn. The plan failed as I didn't anticipate the mortar hit that would waver Palace Guard and I made a mistake of allowing Greater Elemental to flank charge the cavalry.